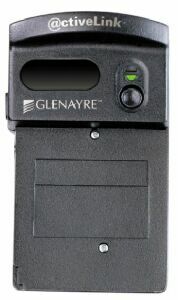 Is your company thinking about purchasing 2-way pagers and PDAs at the same time? Did you drop your SkyWriter in the toilet again? Then check out the @ctiveLink by Glenayre. The wireless revolution for the Visor is coming. The @ctiveLink will never win any beauty contests. This 3.5 oz Springboard module is the bulkiest one to date, and is obviously geared towards the enterprise market. Green and Red indicator lights let you know when the @ctiveLink is on, when there's a problem, and when there's a new message. A quick-access button takes you to an @ctiveLink application so you can see which applications have new messages. When inserting the module, there is no delay in waiting for the service to connect. Communication is almost instantaneous. An on/off switch on the left side of the module helps conserve battery life (which is rated at four weeks for its 2 AAA batteries), and a release switch makes sure that you don't accidently remove the module. The release switch takes some getting used to, and there were several times when the Visor had to be soft-reset after removing the module. Whether this is because I didn't remove the module slowly enough or because of other problems I cannot say. The module can receive messages even when it's outside the Visor, and can hold up to 150,000 characters. There is also an internal backup battery that must be charged for 2 hours using your first set of AAA batteries before you can use the module. You can also check the service availability when the @ctiveLink module isn't in the Visor. Hold down the module's button for a few moments -- green-only means Full Service, red & green means Basic Service, and red-only means the module is in Storing mode. » Weight: 3.5 oz. w/ batt. » Size: 3-5/8" x 1-7/16" x 2¼"